The international Russian agriculture trade show YUGAGRO took place for the 23rd time at the end of November in Krasnodar, Southern Russia. According to surveys, both exhibitors and visitors were very satisfied. On app. 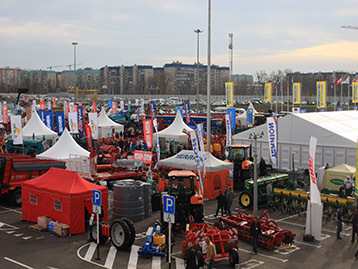 60,000 sqm, YUGAGRO 2016 registered a record of about 720 exhibitors from 32 countries and 48 regions of Russia, including 179 international exhibitors presenting tillage equipment, tractors, harvesting equipment, seeds, irrigation, agrochemicals, grain storage and drying, fodder production, equipment for animal husbandry as well as processing of oil seed, meat and milk. Altogether 15,873 trade professionals from different regions of Russia and neighboring countries visited the exhibition, five percent more than in the previous year. Official national presentations from Germany, France, Hungary and China were part of the fair. YUGAGRO 2016 was officially opened by the First Deputy Minister of Agriculture of the Russian Federation Evgeny Gromyko and the Honorary Consul of the Federal Republic of Germany and General Manager of Claas Russia Ralf Bendisch. Minister Gromyko emphasized the fact that YUGAGRO is the largest agricultural exhibition in Russia, and called for further political support of the fair. The trade show was accompanied by a comprehensive conference program. Exhibitors and guests had the opportunity to visit more than 30 different events on agricultural topics.Due to the import ban on a range of food products from EU, Russian agriculture and food industry is expected to grow in 2017 With some 120 million hectares, Russia possesses 9% of the worldwide available arable lands and relies on modern technologies from European manufacturers and their know-how in education and training of staff to modernize agriculture. From 2017 to 2019, the Government will subsidize domestic agriculture in addition to the previously estimated 250 billion rubles with 92 billion rubles (approx. 1.3 billion euros). This is the result of a development plan prepared by the Ministry of Agriculture of the Russian Federation from 2013 to 2020. Accordingly, the industry will be additionally subsidized for the year 2017 with 10.6 billion, 2018 with 39 billion and 2019 with 42.9 billion rubles. The next edition of YUGAGRO will take place from 28 November to 1 December 2017. Interested companies may pre-register with the organizer IFWexpo Heidelberg GmbH now in order to secure a good stand location.